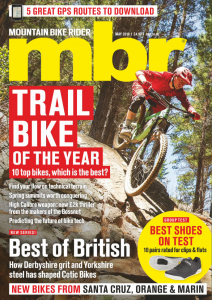 The new Lyrik from RockShox has been likened to the Pike, but here we find out that it is a far greater catch.. Increased stiffness and improved control over Pike. The new Solo Air spring provides more support and Bottomless Tokens are now available for the Dual Position Air forks. 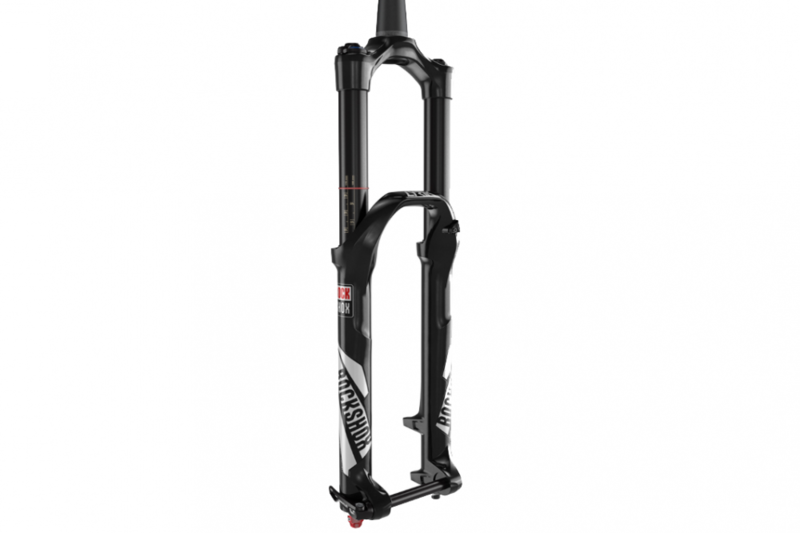 RockShox will also offer a Charger upgrade kit for the old 26in Lyrik. 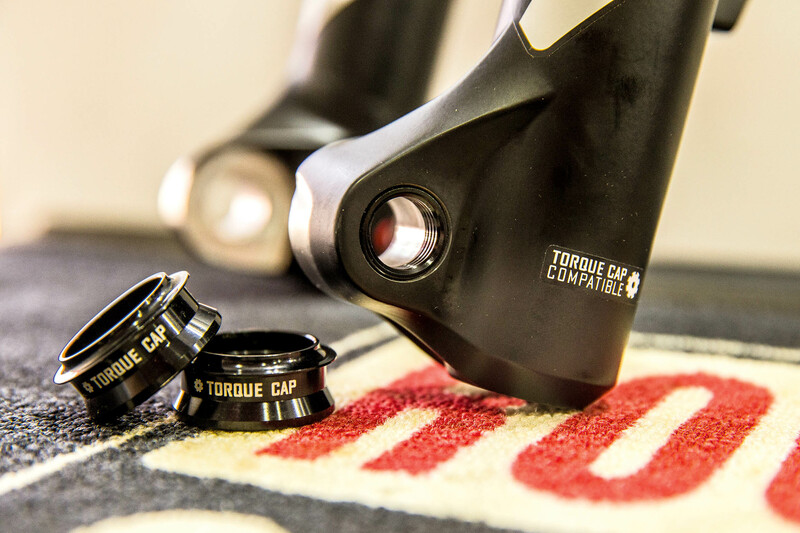 Currently the Torque Caps are only available for SRAM hubs. It’s easy to take one look at the new RockShox Lyrik and declare that it’s just a pumped-up Pike. And, in some ways it is. To begin with, it’s got 35mm upper tubes, just like the Pike. The old Lyrik had 20mm dropouts, the new version gets the lighter 15mm Maxle, just like the Pike. And the similarities don’t stop there. Internally the Lyrik sports a Charger damper and comes with the option of a Solo Air or Dual Position Air springs, just like the Pike. It’s what you can’t see that really sets the Lyrik apart. For instance, the 35mm upper tubes are thicker, to boost stiffness. 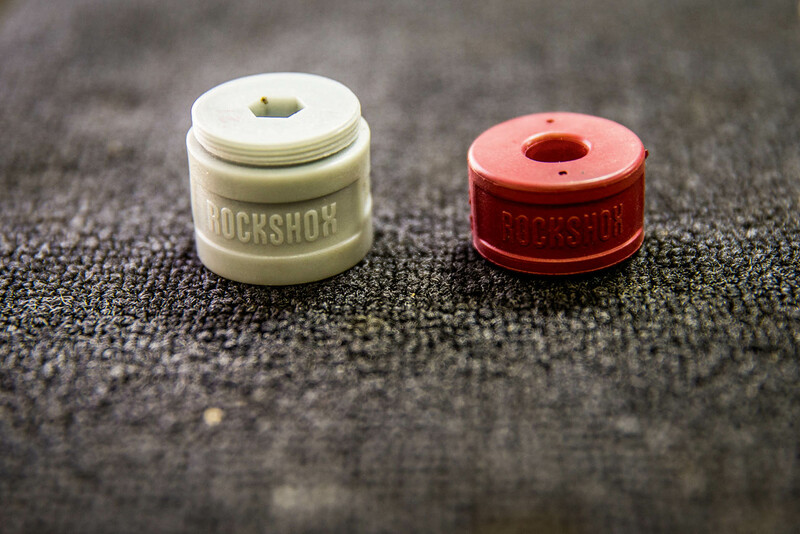 This is why RockShox had to use slightly smaller Bottomless Tokens in the Lyrik. To distinguish them from the Pike versions, they are grey instead of red. The fork crown is also deeper, again to improve stiffness and handle the extra leverage imposed by the 180mm travel option. 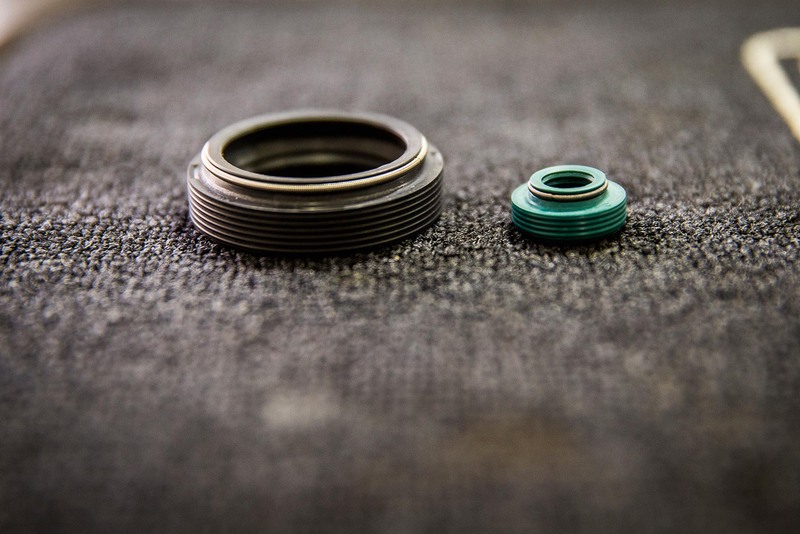 At the opposite end of the fork, the dropouts have larger inner surfaces that mate perfectly with the 31mm oversized hub end caps, for extra stiffness. It’s not a new concept; Specialized used 28mm end caps to boost steering precision on quick-release forks, but RockShox has upped the stakes to 31mm and branded it Torque Cap Compatible. Initially the oversized end caps will only be available for SRAM hubs, but the dropouts are fully compatible with all current 15mm hubs, you just won’t benefit from the stiffness gains. Making the Lyrik stiffer than the Pike is only one small part of the story; friction has also been reduced. Previously, RockShox used separate oil and wiper seals, but it has now partnered up with SKF to produce a single seal that keeps oil in and dirt out. The biggest improvement on the Lyrik, however, is the new Solo Air spring. RockShox has taken the stronger negative spring that it developed for the DebonAir cans on its rear shocks and adapted it for use in the fork. Obviously this improves small bump sensitivity, but more importantly, it allows you to run higher spring pressures without the fork ever feeling as though it’s topping out. This in turn means you can use the spring for better support without the need for lots of Bottomless Tokens. 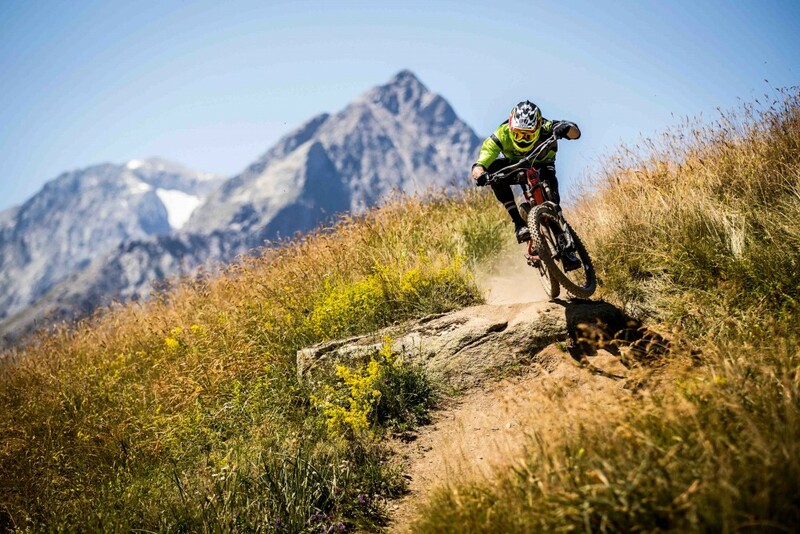 In fact, the 170mm travel fork that I rode in Les Deux Alpes only had one grey Bottomless Token fitted and the fork never felt divey, even though all of the trails I rode were super-steep and I spent a fair amount of time riding the brakes. The trails were rough as old boots too, but after three days my hands were still in good shape. Based on my first few days on the RockShox Lyrik, I can confidently say that it’s better than the Pike, and the 200g weight increase is a small price to pay for the extra confidence. 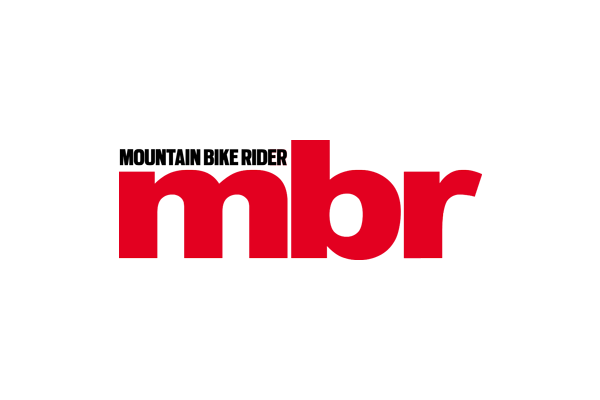 The real question is… can it outperform the Fox 36? Maybe it’s time for another head to head test!